1. Typical sandy desert with loose sandy grey and grey-brown soils of ancient alluvial plains. 2. Pebble-sand desert on gypsiferous, grey-brown soils of Tertiary plateaux. 3. Gravelly, gypsiferous deserts of Tertiary plateaux. 4. Stony deserts on mountain slopes and hills. 5. Loamy deserts on slightly carbonate, grey-brown soils of the elevated plains of the northern Aral Sea. 6. Loess deserts and semi-deserts with grey soils of piedmont plains. 7. Clayey takyrs on plains and in ancient river deltas. 8. Badlands in the Paleogene low-mountain deserts and semi-deserts composed of saline marls and clays. 9. Solonchak deserts in saline depressions and along the sea coasts. The following description of desert regions focuses on the main edaphic and morphologic types of deserts-sand, sand-pebble, rock debris-gypsum, rock and rock debris, clay, loess, takyr, and solonchaks. The predominant landscape in Central Asia is a sandy desert. Sandy deserts comprise the Karakum, the major part of Kyzylkum, Muyunkum, Sary-Ishik, the Aral Karakum, Greater and Lesser Barsuki, the Volga-Ural sands, and others (Figures 12.1 and 12.3). The Karakum desert occupies most of Turkmen territory eastward from the Ustyurt plateau, extending between the Amudarya river and the Kopetdagh mountains. Its northern part, called the Transunghuz Karakum, is gently inclined to the west with abrupt escarpments in the north-east, which extend from the ancient Uzboy valley to Tchardzhou on the Amudarya. Longitudinal dunes, formed by very dark (almost black) sands, dominate the Transunghuz Karakum desert. Most dune chains have a meridional orientation with deviations up to 50-60 degrees in some regions. It is intersected by several minor escarpments and ancient valleys oriented from north to south. Further south a series of ancient lacustrine depressions correspond to the ancient valley of the Amudarya (Paleo-Oxus) — the Unghuz valley, which is more than 450 km long. Longitudinal dunes alternate with kyrs (narrow ridges 5-8 km long formed by solid bedrock) on the southern margin of the desert. The distance between parallel kyrs varies from 1.5 km to 3-4 km and their maximum altitudes attain 70-75 m on the south-western margin of the Transunghuz. The major part of the Karakum desert is called the Lower Karakum. Like the Transunghuz it is covered by longitudinal dunes and, together with some regions of the Sahara and Australia, it comprises one of the biggest areas of longitudinal dunes in the world. Longitudinal dunes of the Lower Karakum form long chains that extend along the meridian (25-30 degree deviation) but with smoother contours compared to the Transunghuz dune ridges. The highest dunes characterize the margin of the Kopetdagh piedmont plain, where the longitudinal dunes are about 25-30 m high, 10-20 km long, and several kilometres wide. Takyrs and takyr-like forms cover the interdunal depressions. This type of relief is typical for a relatively narrow zone between 57°E and 59°E and is limited by the zone of sors on the north. Sor or shor (turkic) represent a saline depression covered with salt crust or loose saline rock. Formation of sors in sandy deserts results from evaporation and salinization of surface and underground water. The rest of the Karakum is dominated by longitudinal dunes, which are about 10-12 m high and about 1-1.5 km apart. Joined by interdunal bridges they form a complex relief of alternating dune ridges and sandy depressions. Smaller ridges, no higher than 3-4 m, often occupy interdunal depressions. Mobile sand dunes (barchans) are less widespread in the Central Asian deserts. The biggest barchan massif is situated in the Karakum along the left bank of the Amudarya. 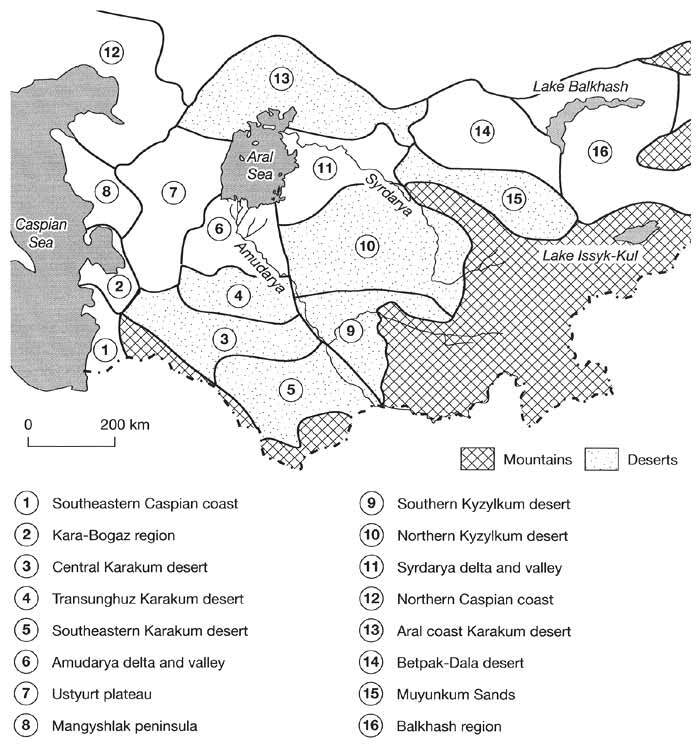 There are also considerable areas of mobile barchans in the Sundukli sandy massif, in the central part of the Fergana depression, and on the southern margin of the Upper Khoresm oasis. Smaller massifs of mobile dunes often surround the more or less important wells and water pits. The Kyzylkum desert occupies the area between the Amudarya and Syrdarya rivers and the right bank of the Syrdarya. Its eastern boundary passes along the Kuldzhuktau and Karatau mountains. Only the western part of the Kyzylkum is represented by sandy desert with dune ridges 10-40 m high. The ridges and outliers are separated by wide depressions whose bottoms are frequently occupied by saline and fresh-water lakes. The sands rest on an ancient alluvial stratum, and in the east, in the zone near the Syrdarya, on alluvial lake deposits (Nechaeva, 1985). A considerable area of the sands is fixed by vegetation. The Muyunkum sands are in the north of the Karatau Range and border the Chu river valley. The desert surface descends from the south-east to the north-west from 660 m to 100 m, and this underlies the sand strata. In the north, their thickness reaches 2-3 m, and in the central and south-eastern parts 50-70 m. The sand strata lie on Paleocene and Cretaceous sea deposits. In the desert relief, cellular and ridge-type longitudinal dunes predominate; their height attains 10-15 m (Babaev, 1996). Sandy desert also occupies the major part of the Caspian lowland. The relief here includes level sandy areas; slightly rolling dunes with 2-3 m rises; areas with sand hills up to 15 m; and shifting sands (barchan chains) with flat windward slopes (13-15°) and steep lee slopes (30-33°). High dunes form where the underlying surface is hilly and the sand covers the rises, often with a layer of only a few metres. The Ustyurt desert, which belongs to this type, occupies the area between Mangyshlak and the Aral Sea. It covers a part of the territory of Kazakhstan, Uzbekistan, and Turkmenistan (Figures 12.1 and 12.3). It is distinguished by a predominance of hills with narrow ranges, valleys, gorges, and solonchak troughs such as Karynzharyk, Kazakhli-Shor, Karashor, Kemalsk, and Barsakelmes. The relief is a combination of eroded low residual hills (turtkuT), generally 2-5 m high, and closed depressions. The highest buttes are Al-Kyr, Muzbel, Kolbai, Tekejik, Koimtdagh, Kaplan-Kyr, Karabair, etc., whose elevations attain 300-340 m. There are numerous stone debris plateaux, solonchaks, ridges, and sandy dunes in the depressions. This region also includes the Uchtagan sand area, with longitudinal dunes extending from north-west to south-east. The soils are grey-brown, mainly loams; sandy loams are rare (Nechaeva, 1958; Glazovskaya, 1996). The Mangyshlak upland has a quite similar relief to the Ustyurt plateau, but is more elevated. It emerged from the sea in the lower Miocene and since that time the peneplanation of the territory has created a diverse relief of residual mountains (Mount Besshory, 556 m) and depressions, where the lowest is the Karagie depression (132 m below sea level) in the south-western part of the Mangyshlak peninsula. The Betpak-Dala desert is situated between the lower course of the Chu river and Lake Balkhash. Its western part is a plateau formed by Neogene deposits. Its elevation is about 300 m. Steep chinks (cuesta) cross the valleys of the Sarysu and Chu. The Zhety-Konur sands occupy the southern part of Betpak-Dala. The central and eastern regions comprise hillocky and ridgy plains. Saline deserts are widespread over the major part of the northern, eastern, and south-eastern Caspian Sea coasts, the Aral Sea coast, and in river deltas and depressions (Kelkor, Mertvy Kultuk, Kaydakm, Barsakelmes, Karashor, Karynjaryk, etc.). The highly saline ground water is close to the surface of the solonchaks and sometimes emerges to form saline lakes. A considerable part of the northern Caspian Sea coast lies below sea level (currently at 28 m below mean sea level, b.m.s.l.) elevating eastward up to 200 m near the Ustyurt plateau. The relief of this area is represented by flat, slightly hillocky plains which were recently the bottom of the Caspian Sea, and are dominated by solonchaks, sometimes with dunes, lagoons, and sink holes. Drifting sand dunes are more typical for the southeastern Caspian coast. The sands and solonchaks are almost devoid of vegetation. Solonchaks also cover the major part of the Kara-Bogaz region, the shores of the Kara-Bogaz Gulf and the southern part of the Ustyurt plateau. Its landscape is characterized by ancient lake depressions, while the southern and eastern parts are occupied also by the Oktumkum and the Chilmamedkum sand massifs with barchans and longitudinal dunes. The relief of the Aral Sea coast is very complicated, where highlands alternate with saline depressions and lakes, and also with sand areas (the Greater and Lesser Barsuki, the Aral Karakum). Thick alluvial deposits comprise the Syrdarya and Amudarya river deltas. Takyrs, sands, and ancient irrigated lands alternate along the present and ancient riverbeds. Solonchaks are mainly encountered within the dry ancient riverbeds and deltas (the Zhanadarya and Kuvandarya in the Syrdarya delta; the Dryalyk, Akdarya, and Daudan in the Amudarya valley). 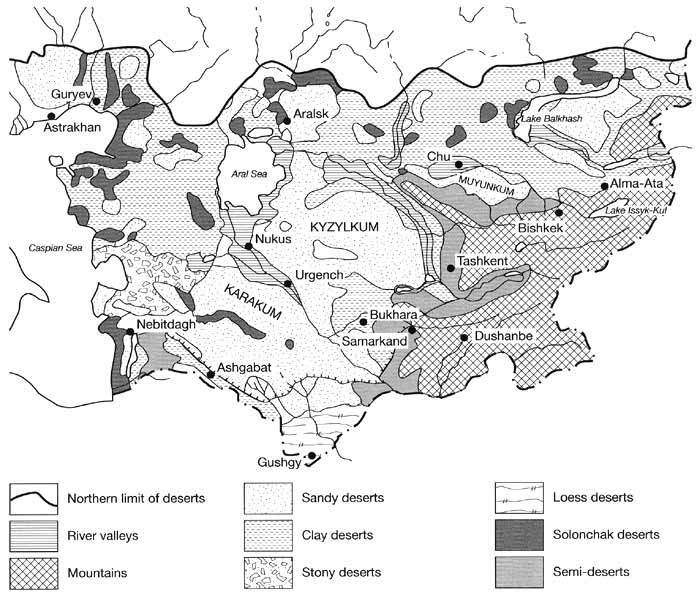 Piedmont and loess deserts occur in the piedmonts of the Turkmen and Khorasan mountains, Hindu-Kush, Parapamiz, Pamir-Alay, Tien-Shan, and Dzhungarsky Alatau, occupying sloping partly eroded plains formed by alluvial fan deposits and alluvial clay and loam sediments (Nechaeva, 1985). They have grey soils, which are slightly saline but very fertile when irrigated. The entire massive of the Golodnaya Steppe loess desert in Uzbekistan was transformed by irrigation into one of the biggest agricultural regions of Central Asia.